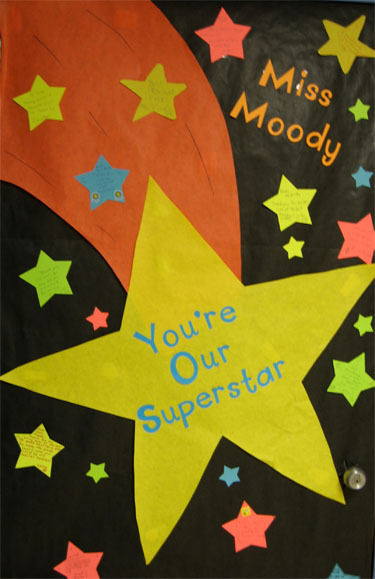 At our local elementary school during the week of Teacher Appreciation (first full week in May) parents and students decorate their teacher’s doors. Here are some fun ideas! 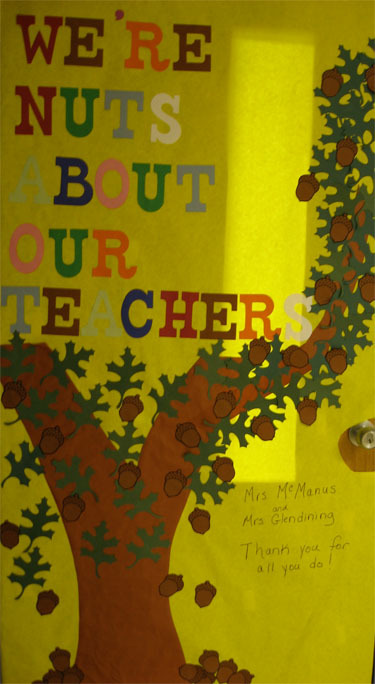 You will also want to check out these teacher appreciation door decoration ideas and also these door decoration ideas. If you are looking for another cute saying to use to decorate try these cute sayings for teacher appreciation. 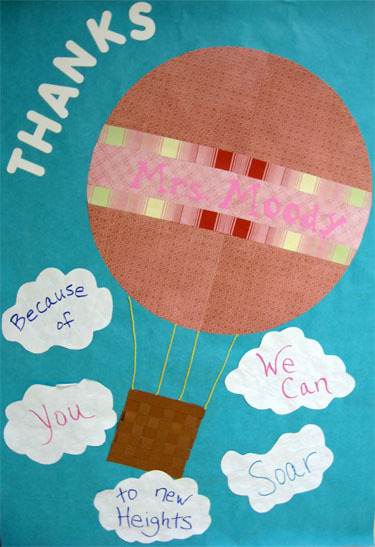 There are so many ways to say thank you for Teacher Appreciation! If you have a fun idea you would like me to include and link to you please send me an email! i likes it very much! i will defenitley do it!!! I have been exploring for a bit for any high-quality articles or blog posts on this kind of space . Exploring in Yahoo I finally stumbled upon this site. Reading this info So i'm glad to express that I have an incredibly just right uncanny feeling I discovered exactly what I needed. I so much no doubt will make certain to do not put out of your mind this site and give it a look regularly. LOVE IT!!! I am using this idea to honor our "Specials" Teachers i.e. Art, Music, Librarian, Computer etc. Each of my son's classmates wrote a note of appreciation or what they love about their "specials" teacher. I provided special note paper in theme of each door. QUESTION - I am looking to do the same for our school nurse whom everyone loves. National School Nurse Appreciation Day is also this month. Does anyone have an idea for a saying?? I am thinking of having the class write their notes on band-aids (printed from google images). 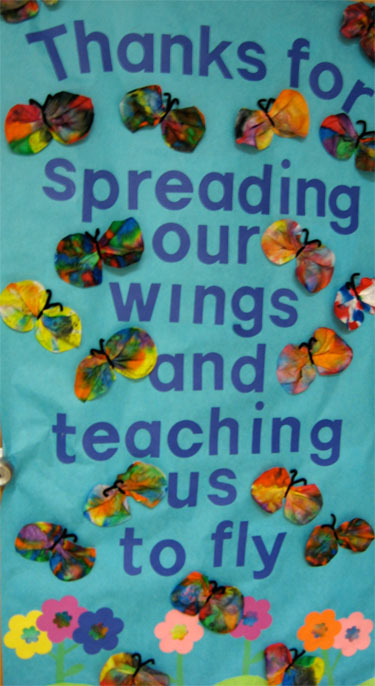 I think this is a great idea and I helped my daughter's first grade class make the butterflies and then I made the door banner. Thanks for all the cute ideas you have on your site. Such cute ideas. 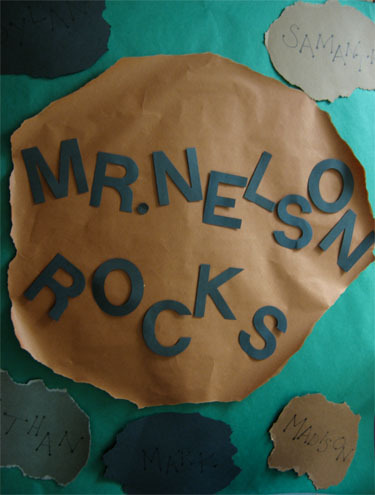 I love the Mr. Nelson Rocks. I have to use that for my 2nd graders teacher she would LOVE it. great ideas, last year they had asked me to do my sons teachers door bc they couldn't find anyone else who would do it. i had the hardest time coming up with something cute, fun and that said thank you, i ended up doing flower pots with blooming flowers that sai thank you for helping us grow. i love your blog name! My 4 year old skips around the house singing in the song all the time. :-) Wonderful blog you have here! Those are great ideas! I loved doing this for teachers when I was a child. What cute ideas and this would even be great on a child's bedroom door. These are wonderful ideas! Thank you for the inspiration. I love the tree and nuts!